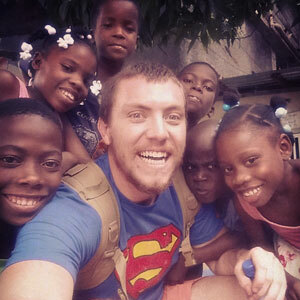 As many of you know The Fond Blanc Foundation was formed in conjunction with the partnership between Pastor Jean Claude’s Orphanage and Next Step Ministries (NSM). My role this summer as the Next Step construction leader and a foundation intern was to be the physical embodiment of that symbiotic relationship. Our goal for the mission team’s construction projects going into the summer was originally going to be building the walls and columns for the new recreation room/library and bathrooms for the children on the second floor of the orphanage. The idea behind this project is to give the kids a space where they can read, study, play and just generally be kids. As it is now, the orphanage does not have much in the way of free space. Currently, the kids must choose between staying in their rooms or playing on the veranda of the second floor, in the new church or in the front yard. 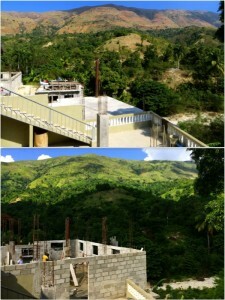 All of these areas (minus the bedrooms) are outdoors and exposed to the elements, which in Haiti are limited to scorching hot or torrential rain. We are thrilled to be working on providing them with their own space that is indoors and dedicated to their spiritual growth and intellectual development. Unfortunately, Haiti did what Haiti does best and threw us a curveball before the summer really even had a chance to start. Less than 24 hours after the NSM interns had arrived at the orphanage, a huge storm came through and completely washed out the road leading up to Fond Blanc from the town of Casale (the nearest population center to FB). The road itself was unpaved and ranged from 10-15 feet above the water level, running parallel to the river. After years of unchecked erosion, the whole thing eventually caved in, leaving a path barely wide enough for a donkey or motorcycle to cross at its narrowest point. Without an alternate route we had no practical way of getting supplies and materials up to the orphanage so we were forced to change our focus to repairing the road. We spent the first half of the summer solely doing road repair work, which consisted of placing steel wire baskets along the face of the collapsed road and filling them with stones from the riverbed itself. The cages themselves were roughly 16’ x 4’ x 4’, and we placed and filled nearly 40 of them. Needless to say this was a massive undertaking, but thanks to the hard work and perseverance of the missionaries and the local Haitian villagers, who worked alongside us, we were able to get the road operational again by the fourth week of the summer. Once we had the road patched up enough to the point where trucks could safely cross, we were able to shift our focus back to the rec room. While the road still needed work, we were able to divide our crews and tackle both projects simultaneously. Starting at week 5, we began pouring curb footings to act as the foundation for the block walls that would make up the new rooms at the orphanage. Throughout this entire process we employed the help of two local masons, Fred and Fernand, who were instrumental in assisting the mission teams (and myself) with mixing concrete, tying steel and laying block. Once the footers were done, the walls themselves seemed to shoot up. After about 5 courses of block we began building formwork and pouring the columns that will serve as structural supports for the roof. Despite our unexpected setback, we were able to finish all of the exterior walls and columns as well as the interior columns by the end of the summer. Starting next summer, we will pick up where we left off with the bond beams, then form and pour all of the support beams in preparation for pouring the slab that will make up the roof. At that point the structure will be essentially complete and we will just have to finish up with the interior walls, installing the plumbing and electrical fixtures, windows, doors and paint. We have also made great strides in our sustainability projects with the addition of the newly-built chicken coops and the wall that will protect our chickens and vegetable gardens from intruders. While we don’t have any chickens yet, everyone in Fond Blanc is waiting the new arrivals! 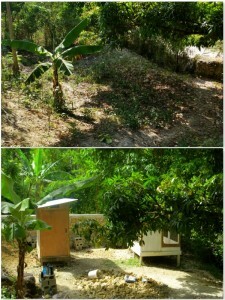 Photos: Before and after photos of our newly built chicken coops. 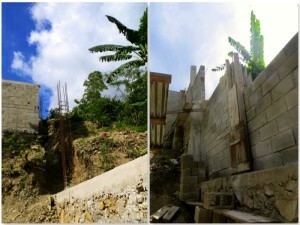 Photos: Before and after construction of the wall that protects our chicken coops & vegetable gardens.